Zion in Novebmer....I can't tell you enough that the best time to visit national parks or anything touristy is during the off season. Yes, it was a tad bit cooler...ok it was freezing like full on frozen waterfalls...but man, what an experience. My children and I had the place to ourselves...no worrying about shuttles or getting stuck behind slow hikers. It was rad. As you can see from the pictures we just bundled everybody up. Living in Oregon and having a large family we have accumulated the right outdoor gear for many adventures. This is an image from the top of Angel's landing. Oh my goodness this use to be our ultimate hike, until we hiked amongst pit vipers, tarantulas etc. in the thick underbrush of Thailand. This is a strenuous trail in Zion National Park with steep drop-offs and very narrow sections. Not for anyone afraid of heights! ( Well, I shouldn't say that because I am deathly afraid of heights, but I make myself do it) The first 2-miles are paved and well-maintained. Ends at summit 1500 feet above Zion Canyon. Last 0.5 mi (0.8 km) follows a steep, narrow ridge; chains have been added in the most difficult areas. Ummm...yeah, this was covered in slippery Ice and snow when we went...a bit more challenging but an adventure for sure. The last half-mile is across a narrow sandstone ridge. Anchored support chains are attached along some sections of the sheer fin. Sheer cliffs at high elevations while hiking on a narrow fin is crazy and Im not sure how more people don't die here every year..But I tell you one thing its has amazing views of the whole park...it doesn't even look real. oh, but my darling..what if you fly?! Emerald Pools trail head was one of the kid's favorite. There are three pools. The trail to the lower pool is .6 mile one-way and is paved. Pretty easy peasy. The Middle Pool is a short but rugged hike up and is not as cool as the other two. The Upper Pool is .3 miles beyond that and it is a rugged uphill hike, but our kids did it no problem and one of us always carrying a baby. The Upper Pool is surrounded by red rock cliffs and when we were there frozen water was pouring out and just breathtaking. Weeping Rock. is a 5 mile round-trip, mostly uphill going there and back. During winter there is frozen ice through out the trail so be careful and some water will probably drip on you, but extremely beautiful! The Narrows is the reason I was so drawn to Zion. It has an absolutely breath taking and awe inspiring terrain like no other.The Narrows is the narrowest section of Zion Canyon. This gorge, with walls a thousand feet tall and the river sometimes just twenty to thirty feet wide, is one of the most popular areas in Zion National Park. You can get there by hiking along the paved, Riverside Walk for one mile from the Temple of Sinawava. 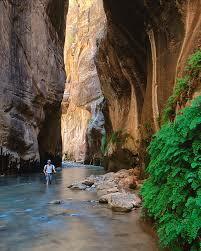 If you wish to see more, you will be walking in the Virgin River. This can involve wading upstream for just a few minutes or it can be an all day hike...Being here in November we decided not to rent wet suits this time and only waded to our knees... I wish we could have gone further...It's indeed on our list to come back and do it when the babies are older. If you go to Zion please please check this hike out. We sat here after a long day of hiking and ate our sack lunch..(Phoenix showing Phorest a few chords on the ukulele) When we went on this trip it was during the school year. Nick and I find it just as important to spend time as a family and witness some of the landscapes our massive earth has to offer just as important as reading, math etc.. Thats why we are dedicated to raising our children outdoors. We thrive in it and so do they. Court of the Patriarchs....a quick and easy two-minute trail takes you to a little viewpoint above the trees and offers a good view of the mountain formations across the canyon that are known as the "Court of the Patriarchs." This collection of peaks are individually named Abraham, Isaac, and Jacob, but two other formations named The Sentinel and Mount Moroni are also featured prominently from this vantage point. This is a great spot for a photo opportunity, especially in the morning sunlight. There was so many awesome memories made on this trip. Zion has such a different and unique landscape unlike any other with it's rock faces to it's beautiful emerald pools. There is just too many things to do to list them all, but I hope that this inspires another. If we can do it with all these kids so can you and don't forget Zion in Winter can be just as beautiful if not more.